Various sticker activities have kept me busy this summer, making it difficult to find time to write blog posts. That, plus my home laptop died, so I don’t have the chance to write in the evenings. Basically, though, all is very good. I gave a paper presentation at the Return to the Street conference at Goldsmiths University of London in June, and I’m heading to the University of Brighton in early September to present at their 7th Annual International Interdisciplinary conference entitled Riot Revolt Revolution. From over 70 speakers, I am one of seven from the U.S. In addition, the Contemporary Street Art digital collection (catalogued) on the St. Lawrence University art gallery Web site and stickerkitty’s collection (uncatalogued) on Flickr continue to grow. Thanks goes to Arline Wolfe at SLU for her cataloguing work in July. I was also given the opportunity to contribute another exhibition review for the Journal of Curatorial Studies and wrote about the 7th Berlin Biennale, after viewing the show during my last trip to Germany in late April/early May 2012. And my big project on the home front for the past two months has been to put together a mega-sticker exhibition that hopefully will travel to colleges and universities in the U.S. and elsewhere. Organized thematically, the exhibition features several hundred stickers dating from 2004 to 2012, primarily from Germany, the U.S., and Canada. Carole Mathey at SLU has begun to photograph the sticker boards that make up the show, and these will be used to publicize the exhibition. More on that to follow. 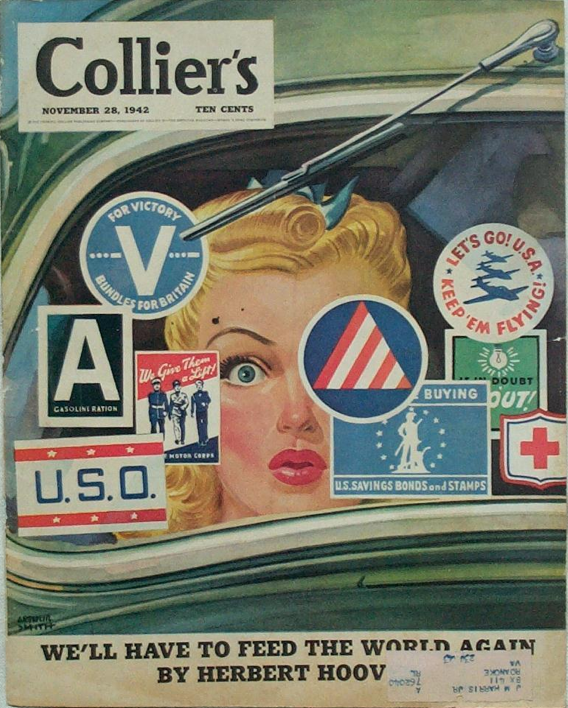 In the meantime, check out this 1942 magazine cover from Collier’s.